Ultra Fusionfall Forum > Forum > General Boards > FanFic and FanArt Board > Ashy sprites! 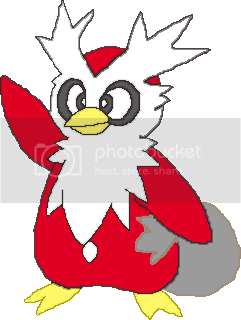 I simply traced one of Delibird's official artwork and turned into a sprite. I don't like it because of the shading. While the little shading next to the lines is nice, it just doesn't make the sprite come to life imo. (BTW, Photoshop does it automatically, not me). 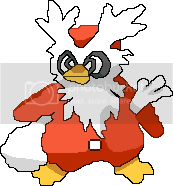 So I'm trying to make a sprite for character to fight in a fighting game for example, but I can't shade or you know, make them look high resolution. So I will be posting my sprites here and hopefully I get better over time. It's pretty good, only issue is shading that I can see but I'm sure you'll grow your style over time. Look forward to seeing more from you! 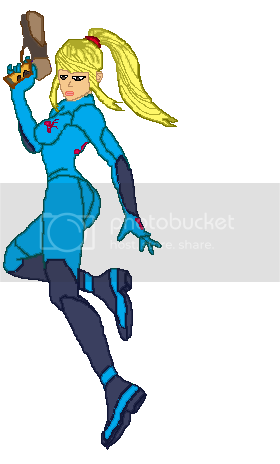 You ask, why Samus? Because my hormones told me to. I used her brawl artwork as a base to trace. I still can't get the shading right and I still can't get the high resolution right. Imo, she looks atrocious. Facial features aren't my thing either, I can't even get the eyes or mouth or nose. Anywho, I will be trying again in the near future and hopefully do better next time. I would totally want to see a awesome sprite fight. It's a semi good attempt, it only looks a like wonky because like Viva said, you can't get muscle memory with a mouse and I traced it bit wonky. Other than that, it's great imo!